Hoop Skirt Parameters: different Hoops and Lays to choose: Waist 24.4 inches to 36.2inches (adjustable), Height 39.4+/-2 inches. 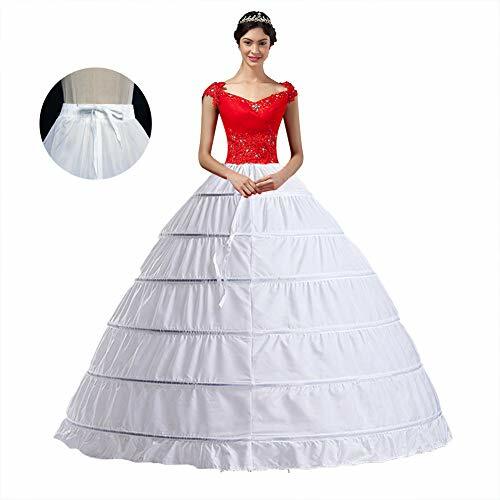 This white petticoat have 6 hoops and the the stainless steel hoops give strong support ,the bottom is puffy.Crinoline petticoat is perfect for for ball gown wedding dress prom gown Quinceanera dress and evening gown.Normally wedding and prom dress need to wear petticoat underneath to adjust the shape and then improve the effect of dress.wear underskirt inside of the dress,the wedding dress looks very charming and puffy. ❥Hand wash or dry clean,separate washing,no bleach,no Wring. Please Hang Dry. Avoid Long Time Exposure to Sunlight. ❥If you have any problem, please feel free to contact us. ❥Please refer to our size chart before you place the order,there may be 1-3cm errors. ♥Crinoline Petticoat's size-Skirt full length is about 100 ± 5cm. The maximum circle diameter is 124cm / 49in. Elastic Crinoline underskirt waist is 66-100cm / 26-39.3in, suitable for US size 2 to 18 ball gown dress. ♥Adjustable waistline-The Drawstring can be adjusted freely according to waistline, will give full protection, can prevent your skirt from slipping, let you keep you in a graceful posture always. ♥Underskirt's Perfect Function: It will help shape your dresses and makes it more puffy and elegantly beautiful. You will be the focus of the audience. Perfect with Wedding Dresses Ball Gown and any Formal Dresses. ♥Friendly Notes-If have any problem,feel free to contact us,we make the pleats by handmade and make the petticoat looks more amazing and puffy.Addition,Hand wash or dry clean,separate washing,no bleach,no Wring,steam to de-wrinkle. If you have any questions about this product by YULUOSHA, contact us by completing and submitting the form below. If you are looking for a specif part number, please include it with your message.